2017 OTW Board Voting Now Open! Every member who joined between July 1, 2016, and June 30, 2017, should receive a ballot shortly, if they haven’t already. If you do not receive one by 2 a.m. UTC Friday (what time is that for me? ), please check your spam folder first, then contact us via our contact form. The election will run through 11:59 p.m. UTC on Monday, Aug. 14; check this time zone converter to find out what time that will be for you. 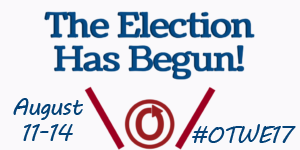 Once you’ve voted, you can head over to Twitter and use the hashtag #OTWE17 to let us know! At this time, all eligible OTW members should have received an email linking to the voting instructions for 2017. The subject line was “Voting Instructions for Organization for Transformative Works (OTW) Board Election”. Please note that anyone who didn’t receive this email is not on the voter rolls this year and will not receive a ballot. To vote in this election, your receipt must be dated between July 1, 2016, and June 30, 2017, inclusive of both dates. Jessie Camboulives graduated from the Sorbonne Law School, and is currently working towards an LL.M. in Digital Law. She discovered fandom in 2007 with Harry Potter fanfiction, but since then she has become a fandom hoarder, with a current passion for Overwatch and Yuri!!! On Ice. Jessie joined the OTW as a French translation volunteer in 2015, after stumbling on one of Legal’s news posts. She is now serving as a tag wrangler and Support staff, where she works to ensure that AO3 users have the best possible experience on the site. Milena Popova has had an on-again/off-again relationship with fandom for well over two decades (don’t do the maths!). After fanfic thoroughly ruined their ability to enjoy mainstream popular culture beyond the “price of entry” into fandom, Milena decided to make a career of this and is currently completing their PhD research into representations of sexual consent in fanfiction. In a past life they were a technology/project manager at a large multinational, and they also have a large amount of past and current volunteering experience up to and including serving on the boards of two UK non-profits. Within the OTW, they have been a tag wrangling volunteer for two and half years, and more recently a Comms staffer on the Fanhackers project. Milena is thoroughly owned by a cat named Chili (also known as Cultural Theorist Cat), with whom they live in the south-west England. Gimena Calixto is an Audiovisual Media student in college with experience producing and participating in diverse projects in the field (doing camera work, video and sound edition, etc. ), but even more experience in being fannish over them. She stumbled upon fandom in 2002 and has never left since, her interests ranging anywhere from anime to bandom to books to comics to TV series over the time. Fandom has given her not only a creative outlet and a way to connect to like-minded individuals, but also a way to better a lot of her skills and grow as a person through the exchange of opinions and knowledge. Volunteering for the OTW has been her way to give back to fandom. She first joined the OTW as a tag wrangler in 2016, and later on joined the Abuse committee. Erica Dulin has been a volunteer with the Organization as a Tag Wrangler since late 2014, and a staffer since early 2016. She’s had the opportunity to work with a diverse volunteer pool in several work groups and projects, and she loves to learn about people and the things they are passionate about. She majored in Film & Television Production and her forever fandoms are Achievement Hunter and Rick and Morty. Erica is a true believer in freedom of speech and will uphold the Organization’s dedication to protecting fan creators’ right to share all of their creations, no matter what backlash they may garner from their works.